“You CAN Write 50,000 Words in 30 Days” | An exceptional memoir by Debut author DJ Mynatt! That is more than just a promotional blurb… that is precisely how I feel about this book! This book is truly a gift to authors everywhere! If you are an established author; it will give you a look back and reminder about your own beginnings… and some great laughs. If you are a reader who enjoys an inside look at the life of your favorite authors; this book will give you just that… a look at how one amazing author got her start in writing. This is a book that anyone… everyone can enjoy reading again and again and again! Here is a brief synopsis from S&G PUBLISHING! Every year, people from all over the world log in to their NaNoWriMo profile, find a local group to hang out with all month, stock up on snacks, sharpen their pencils, get their playlists ready, and write! 50,000 words sounds crazy, right? Well, most writers ARE a little crazy! Read about one woman’s journey and you will see that you CAN write 50,000 words in 30 days! DON’T MISS THE Facebook Party to Launch this amazing book! Invite your friends! Spread the word. These giveaways are too amazing to miss! We have 13 GUEST Authors (including yours truly) who will be giving away books (paper AND digital copies) and chatting it up with readers and fans! I can not believe I’m late reviewing THIS book! Jennifer – you should smack me. But seriously… I thought I had already reviewed it. It was only when I went looking for the review that I realized why it wasn’t there. I know I literally say this about every book Jennifer puts out but I seriously think this is my favorite so far! I don’t know how Jennifer does it – I mean she comes up with these wonderful stories that are full of such life and good humor and faith – and there are no two alike! One other thing I LOVE about Jennifer is that she is not shy at all about tackling serious issues! She brings them to light and shows her readers just how dangerous these things can be! So… not only will Huckleberry Harvest make you laugh, it will make you think. It will also make you frustrated at how thick-headed some people can be and sigh over how exciting love can be! In short, it’s great, it’s humorous, it’s exciting, it’s REAL! I did say it’s the best one yet right… ? Yes, I thought I did! So, what are you waiting for? GO… get your copy! Don’t miss it!!! And, as usual, I can hardly wait to start the next one! Especially since I read the sneak peek! Forget 5 stars! It’s getting 10 stars! Mandy Helmuth doesn’t like Noah Mischler. Not one little bit. First he breaks her best friend’s heart, and then he has the nerve to chastise her for being a busybody. She feels quite justified in her dislike until Noah does something heroic, like save her life, and she’s forced to bestow her grudging respect even as she determines to keep her distance. But when she unwittingly stumbles into his family troubles, she catches a glimpse of the person Noah so successfully hides from others. Will Mandy be able to look past Noah’s rough and unyielding exterior to see the man she is destined to love? Much to Noah Mischler’s annoyance, uppity Mandy Helmuth thinks she has the right to tell him how to live his life. If he weren’t helping Mandy’s grandfather install a stove and fix his roof, Noah wouldn’t be within a mile of Huckleberry Hill or that nosy girl who gives him a lecture every time she opens her mouth. But when Mandy discovers the horrible truth about his father, Noah is forced to reveal humiliating secrets that he’s never shared with anyone. He trusts her with his secrets, but can he trust her with his heart? 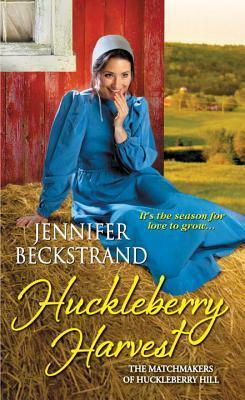 Don’t miss Huckleberry Harvest – Released May 26th! Available NOW! – Tweet this! Felty finally got in on the act! Yes he did! – Tweet this! I was provided this book free through Jennifer’s street team in exchange for an HONEST review! I just LOVE Amy’s book! She is such a talented author! OK… Are you wondering yet – What exactly a Bakery Bunch is…? Well, The Bakery Bunch is what Amy Clipston has named her street team. Do you promote your favorite authors? – Tweet this! Yup… see that book – it’s an Advance Reading Copy! AWESOME! One of the fun ideas Amy and her fearless sidekick Jamie have come up with was this post. All across the web, Bakery Bunchers are posting pics of their awesome swag, how they are using it in their everyday lives and how they are passing it on to other fans of Amy’s AWESOME books! This is a picture of what I included in a recent giveaway! I don’t know about you but I LOVE bookmarks! – Tweet this! Some of us also visited local libraries to pass out swag which is kind of like a trial bookstore – Yes it’s a cold day… it’s January. And hey… Amy is even helping to save the planet – one plastic bag at a time! – Tweet this! My daughter had to get in on the act for this one… she just LOVES pushing that shopping cart! And hey – these awesome tumblers come in handy! Reusable cups help save the Earth too! Plus they look cool! – Tweet this! OK… OK… I had to make this one a little different – I don’t travel much. Isn’t Amy just the greatest! I know I think so! Do you take your favorite authors with you when you travel? – Tweet this! If you would like to check out some of the other Bakery Buncher posts, click the links below… these are in no order other than how I’ve found them posted in our group. Books For Christian Girls – running a Giveaway until 1-20! These are the only ones I know about so far. I will add more as they are posted.